We can honestly say we knew Crusoe the Celebrity Dachshund before he was famous. We were about 2 years into our blog when we discovered and interviewed him as one of our Guest Adventurewieners. Back before he was famous and living the jet-setter lifestyle, his adventures were a lot like ours – hiking, snowshoeing, and kayaking (he still enjoys those things occasionally). It’s been a treat watching him grow into the limelight over the past 3 years. 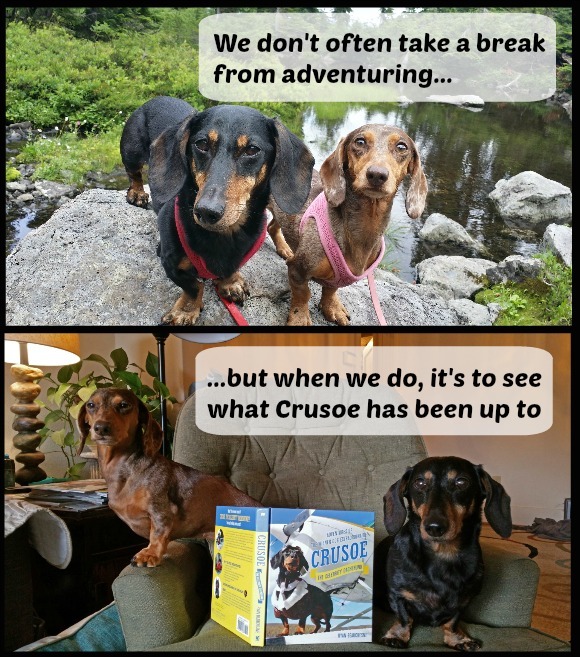 If you haven’t already heard, Crusoe now has his own book! – Crusoe, the Celebrity Dachshund: Adventures of the Wiener Dog Extraordinaire (affiliate link). The book is a collection of stories and funny photos, loosely following the chronological order of his life from puppyhood to stardom, and based on a theme of “seasons”; highlighting his adventures from all times of the year. It features some classic stories that first appeared on his blog but also some fresh, never heard before stories. We had a chance to check out his new book. Chester and Gretel liked seeing all of the exciting and exotic places he gets to go. Their favorites were the skiing trip and his vacation in the Bahamas. To say they were a tad jealous is an understatement. They are dreaming of the day we buy an RV and travel the country to hike and meet their own fans or fly to France to hike the Alps. For now though, they appreciate being able to live vicariously through Crusoe during our down time. 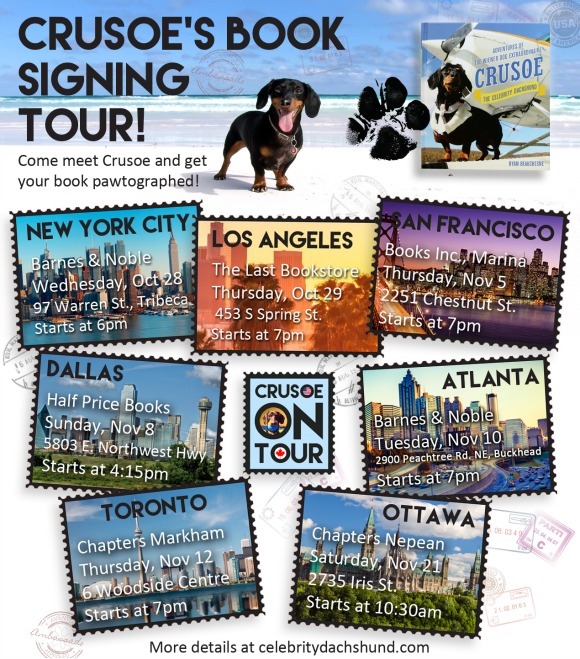 Crusoe is on a tour right now sharing his book and meeting fans. If you see him in person, he will personally pawtograph your copy of the book. Crusoe has already visited New York City (unfortunately he was there before we were for the Purina Better with Pets summit so we didn’t get to see him), Los Angeles, and San Francisco. He still has 4 stops to make though so it’s not too late to see him if you are near one of the remaining places on the list below. Sadly, he didn’t choose to visit Seattle but I guess we don’t really blame him for not wanting to visit during the cold, rainy season. We would have loved to show him some of our favorite adventure spots though. Maybe someday our paths will cross. Even though we didn’t get to meet Crusoe and take him on adventure in Seattle, we did take him on adventure of sorts. 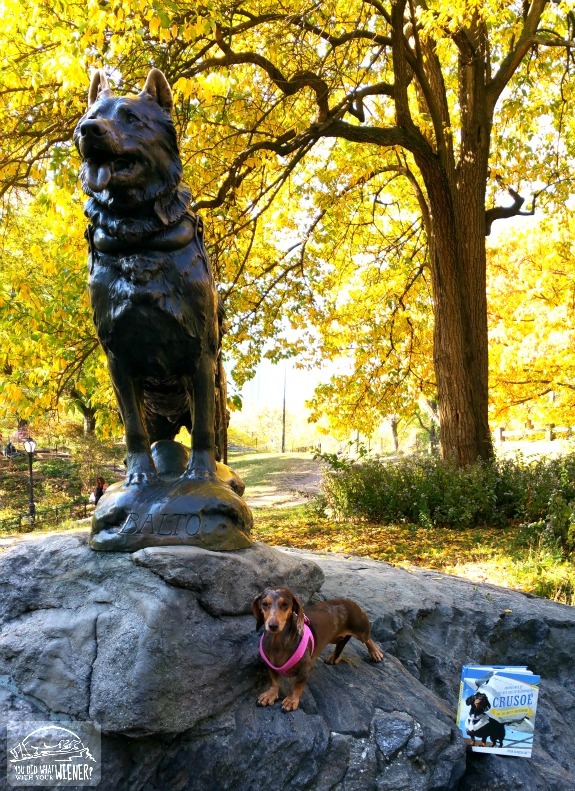 We took him to New York with us just to take a picture of him and Gretel with the Balto statue in Central Park (Balto is the famed sled dog who battled tundra conditions in Alaska to help save the state’s children). Disclosure: Crusoe’s Dad, Ryan Beauchesne, sent us a free book to check out but I was not compensated for this article. However, this article does include a couple of affiliate links. 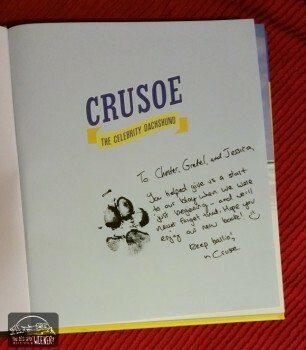 That means that, for everyone that purchases Crusoe’s book, I get a few pennies to help support this blog. Looks like a fun book! So glad you got to take a photo at the Balto statue. Balto was a travelin’ dog just like you!